Thousands of years ago, Chinese physicians recommended Green Tea as a natural path to vitality and longevity. Today we know this delicious tea, with its natural antioxidant properties, enhances the body’s defenses against damaging free radicals. We searched far and wide for the highest quality organic green tea leaves in India, China and Sri Lanka, then carefully combined these delightful teas to create a flavorful and complex blend with a subtle yet elegant aroma. Embark on a journey to vitality with a cup of our Pure Green Tea. very tasty product. Love the little message on the tea bag... my wife actually collects them! Great tasting tea!! excellent tea. the whole family enjoys tea and the quality of this product has us ordering again and again. 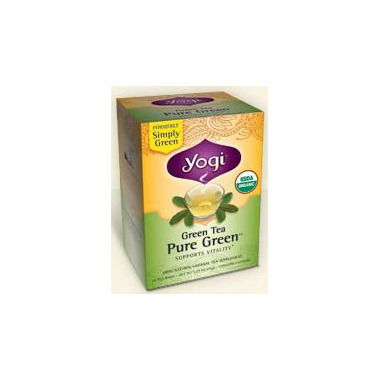 my sons both love this green tea. A great tasting tea, not bitter. I drink it with a little honey. I love the little messages each tea bag has and the tea tastes very good.